To invest you first must be able to save. I like to think that an investment portfolio starts out as a saving portfolio. And to save you must first be able to limit or track your spending habits. Most of us would rather skip ahead to the investing part of the equation but you have to walk before you can run. Hackman and Hoffman were friends back in their starving artist days, and Hackman tells the story of visiting Hoffman’s apartment and having his host ask him for a loan. Hackman agreed to the loan, but then went into Hoffman’s kitchen, where several mason jars were lined up on the counter, each containing money. One jar was labeled “rent”, another “utilities,” and so forth. Hackman asked why, if Hoffman had so much money in the jars, he could possibly need a loan, whereupon Hoffman pointed to the food jar, which was empty. What Dustin Hoffman was doing here is what Thaler has termed mental accounting. Mental accounting is simply a process of separating and evaluating financial decisions. Hoffman’s mental accounting trick was that he prioritized his bills over his discretionary spending (although food is not necessarily discretionary, you get the point). Mental accounting is the process in which we lump specific assets with specific goals and treat them differently even though they are all part of one big pool of money. For example, in your savings account you might have different buckets for emergencies, vacations, healthcare spending or a new car. All of your money is in one account but you have different uses for each bucket and have mentally bookmarked a sum for each specific goal. You can use mental accounting to your advantage by creating a system where you don’t have to track every single purchase. You just have to prioritize what’s important to you, much like Dustin Hoffman did with his mason jars, and don’t allow your spending on lower priority items hurt your results. People generally despise having a budget. Many of us think that not having a budget is some sort of badge of honor. And the person who says they have a budget usually gets mocked for being cheap (that would be me on many occasions). But a budget doesn’t have to be a rigid system that forces you to track your spending to the nearest penny. And you shouldn’t be forced to cut back in all of the areas of your life that you actually enjoy. One of the most important factors in creating a spending plan you can stick with over time is the ability to prioritize. You should feel free to spend money on those parts of your life that are important to you. Make those items a priority but find offsetting areas of your spending that you can cut back on. This is easier said than done, but if we change the way we look at our expenses I think this will make more sense. Fixed costs are your recurring expenses that are paid on a periodic basis. Usually these are the largest expenses in your spending plan. Variable costs change from month to month depending on your plans or desires. Some of them are discretionary purchases (like entertainment and eating out) while others are more mandatory but can change based on your habits (think gas and groceries). People obviously have other expenses than the ones that I’ve listed but the point is to get you to see your spending plan in a fixed versus variable point of view. As a starting point you can list all of your fixed costs in one column of a spreadsheet (or on a piece of paper) and all of your variable costs in another. Once you have them all listed out you can start to figure out how to prioritize your spending plan. Savings should almost always be a high priority so that one is non-negotiable, but all of the other expenses leave some room for maneuvering. Go through the two columns and circle the ones that are really important in your life. Maybe you’re single and really like buying new clothes and going out every weekend. In that case, your priorities are entertainment and clothes. Could you cut back on your living expenses by having a roommate? Or maybe you love to buy the latest Apple products right after they are released to the public. Make new technologies a priority but try to cut back on how much you eat out (or some other variable cost) to make up for that expense. An easy way to set up your spending plan is to simply automate all of your fixed costs so they are paid out of your checking account each month with no work on your part. Since these costs are recurring you know what they will be each month and can plan your spending accordingly. Fixed costs require no decision on your part so they are the easy part of your spending plan. Once you have your fixed costs figured out that part of your mental accounting is taken care of since you now know that any remaining funds are leftover for discretionary or variable spending. Feel free to spend as much as you’d like out of your variable cost bucket on your high priorities but cut back on the other variable costs that don’t mean as much to you. You can think of the mental accounting trick here being that you know your fixed costs can’t be used so you deal with whatever is leftover. That would mean that your variable costs are where you make the bulk of your decisions on a short-term basis. You can probably find small areas to save by cutting back on some of your more frivolous variable purchases, but it’s that’s not going to make a huge dent in your finances over the long-term. Your fixed cost decisions will be where you can make the biggest changes that will lead to an increased ability to save. That means fixed cost decisions can help you much more in the long-term. These large, recurring fixed costs can make a huge difference in your overall spending plan. Look for ways to reduce or minimize your large expenses that are not on your high priority list to see recurring savings. If you can cut back on a few of your fixed costs that will lead to a stream of future cash flows you can use to your advantage. 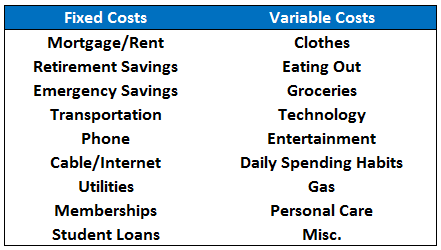 By focusing on the big ticket fixed costs in your life and prioritizing the variable costs in a way that makes you happy you are able to use your money every month without being a slave to a boring budget. You just have to determine what is important to your current situation without compromising your longer-term goals. Creating a spending plan with your fixed and variable costs will give you a greater awareness of your finances. Figuring out your priorities will help you go from “Can I afford this?” to “Does this matter to me?” By taking control of your spending habits you get to choose where your money ends up, not look back to see where it all went. For those of you that have a hard time tracking and separating your expenses using mental accounting I will have a follow-up post next week to show how you can use an online personal finance tool like Mint to make your spending plan even easier and more user friendly. You are right that all portfolios (well at least most of them) start as a savings accounts. Mine too. I guess my first 10 – 20 years will be the accumulation phase where I will be contributing and reinvesting. The jars method is a great method in my opinion and I practice it myself, although I do not use jars in a kitchen anymore, but have dedicated savings accounts, then use the credit card to pay for the need and then pay off the credit card with savings. And that first 10-20 years of accumulation the accumulation phase is very important to allow for compound interest and dollar cost averaging to work in your favor.